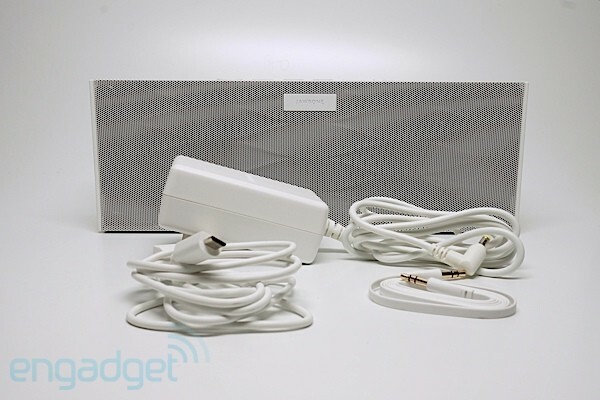 It was back in February when we first caught wind a beefier version of Jawbone's Jambox, thanks to some less-than-stealthy ninjas at the FCC. Today it's officially here. Dubbed Big Jambox, this $300 Bluetooth speakerphone and "smartspeaker" is unsurprisingly a supersized -- yet still portable -- version of the new-age micro-boombox that the won us over back in 2010. Naturally, there have been some tweaks to go along with the bigger footprint, but all the core features including Jawbone's MyTalk apps and noise-cancelling know-how are in tow. Now that we've used it extensively for a few days, we're ready to answer some questions you might have. Does it follow the old adage that bigger is better? How will it fit into your lifestyle compared to the Jambox? And most importantly, is it worth the asking price? How would you rate the Big Jambox? We're serious about this being a jumbo-sized Jambox, by the way. How big, you ask? While the Jambox measures in at about 5.95 inches in length, 2.24 inches in width and 1.57 inches in height, the Big Jambox more than doubles the overall footprint at 10 x 3.1 x 3.6 inches. It's naturally packed on some heft as well, weighing 2.7 pounds in contrast to its .75-pound sibling. The unit is still fairly portable despite the size increase, and this editor carried it around the house in one hand with no issues. Just like the miniature wonder, the Big Jambox features the Yves Behar design-ethic that lets it do double duty as a fashion accessory. The Big Jambox feels less like a toy and more like a capable speaker, as if some of the original's charm was lost in the enlarging process. At a glance, you'll notice the perforated aluminum grill that wraps around the unit, which in this case features the Wave pattern. Like the Jambox, there's just enough flex that you don't have to worry about the grill denting under any pressure you might apply with your fingers. If white isn't to your liking, there are also Graphite Hex (black) and Red Dot variants -- here's hoping that the Blue Wave and Black Diamond palettes available on the Jambox will eventually be brought over, too. There's really only one key difference in the overarching design, and that's the placement of the rubber edges. The Big Jambox has two slim slabs of hard rubber on its sides, with eight rubber feet on its bottom to keep it planted your table; this is noticeably different from the thick chunks of softer rubber found on the top and bottom of the OG Jambox. Overall, it feels less like a toy and more like a capable speaker, as if some of the original's charm was lost in the enlarging process. 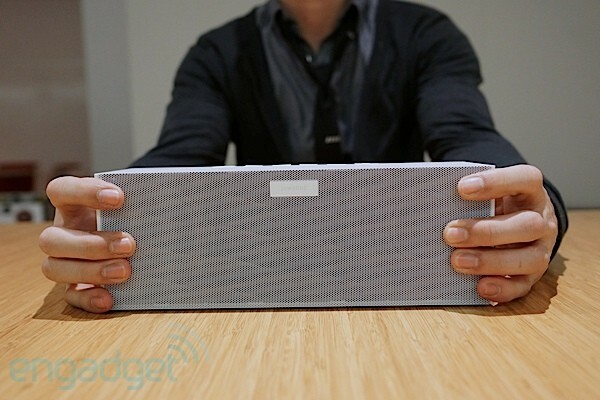 On the inside, Jawbone has kept this puppy rigid without using the glass reinforcement it employed on the Jambox. Moving around the device, up top you'll find familiar talk and volume controls and happily, Jawbone's added play / pause, advance and rewind buttons for use when streaming via Bluetooth 2.1 + EDR. Speaking of, the unit is rated for at least 33 feet of wireless functionality and we had nary an issue with the connection walking around our two-story apartment. On the right side, you'll find a glowing power button, a pairing button, and inputs for micro-USB 3.5mm cables and its power input. All of the buttons have the pleasing resistive and clicky tactile feel as the smaller version, and we're glad to see the dedicated pairing button rather than the sliding mechanism used previously -- and yes, a power adapter, USB cable and a 3.5mm stereo cable are included. The cables are certainly high-quality, but we do have to wonder why Jawbone nixed the hinged prongs on the plug included with the Jambox. It's a small gripe, but it makes a huge difference when packing a bag and going portable with the device. Thankfully, the unit is rated for 15 hours of listening at "moderate levels" and 500 in standby thanks to its 2,600mAh battery, which we still have yet to drain after a weekend's worth of on and off use. Better yet, the unit will automatically turn off aftr a few minutes if nothing syncs to it. Disappointingly, however, you won't be able to leverage that juice (à la Braven's offerings) to charge your gizmos through the USB connection. Setting up the unit was incredibly easy. Upon powering it, you're greeted by a massive whoosh of sound (you'll hear a similar noise when powering down), followed by a female voice telling you the device is in pairing mode (this part only happens the first time). 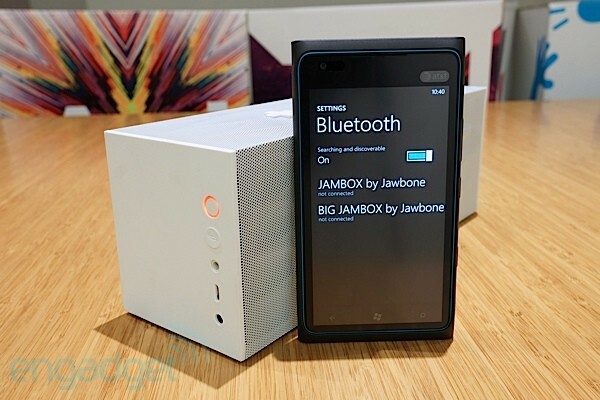 A quick switch over to the Bluetooth settings on our iOS and Windows Phone Mango devices quickly showed the Big Jambox and pairing took all but few seconds. We're bringing up multiple devices for a reason, too. The Big Jambox can be paired with a whopping eight gizmos at once and stay simultaneously synced with two at a time. This allowed us to play music from an iPhone and then simply push play on a Lumia 900 to switch tracks -- naturally, this could make for a terrible party, as it gives impatient listeners a surefire way to interrupt whatever jam the crowd is rocking out to. Our devices generally reconnected without fuss after shutdowns, but we did occasionally have to manually sync things back together. Using its USB connection, you'll be able do things like customize the talk button's functionality and change the tone of the various voice prompts. It's also important to note that Jawbone cites its Jamboxes and "smartspeakers," rather than just wireless noisyboxes, and that's thanks to its MyTalk apps. Using its USB connection, you'll be able do things like customize the talk button's functionality and change the tone of the various voice prompts. You read that right: while the Jambox is devoid of any visual cues aside from its glowing power button, you'll get voice feedback for things like entering pairing mode and reminders for G-cal appointments (the Android Companion app, exclusive to the Big Jambox, is required for that last bit). You'll also hear various beeps for adjusting volume and the like. Sadly, all iOS users get is a volume indicator, as Jawbone notes that the APIs to make a comparable iOS app are currently unavailable. Riding further on the downer train, Jawbone doesn't have any updates to share regarding Windows Phone or BlackBerry apps. However, a Jawbone rep did tell us that if there is enough of a demand the company's dev team would consider branching out. If there's one area where we're both impressed and disappointed, it's the sound quality. On the one hand -- and not surprisingly -- it's extraordinarily powerful for its size, and puts the bass reproduction of many comparable speakers to shame. 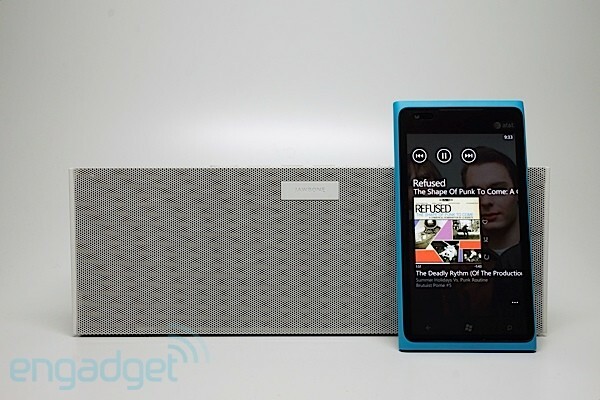 Not to mention, it'll trump most of your devices' built-in speakers just as the Jambox did. Getting into the arbitrary numbers, on the inside of its airtight enclosure you'll find a duo of active neodymium drivers and dual-opposing passive bass radiators (helping the unit to stay and place while rumbling) that can roughly pump out a massive 110SPL (versus the Jambox's 85) in a loudest-case-scenario, depending on your content. Even so, it essentially suffers from the same aural flaws we came across with the little one; the high-end response is passable, distortion seeps in at the final three to four clicks of volume and music still sounds like it's trapped in a not-so-Heart-Shaped Box -- all this despite Jawbone's efforts to add sound-shaping algorithms such as its Live Audio technology (more on that in a moment). That distortion can vary depending on your source material, however, and Jawbone notes that it would rather have people turn down the volume than artificially tweak the audio more than necessary. We do need to make one thing very clear: The Big Jambox, like the original, is excellent at pushing out gobs of volume and very good sound for its size. That said, according to the company, the unit employs a loudness compensation algorithm throughout the volume range to balance the highs and lows, multi-band compression that aims to kill distortion and its own blend of equalization. Mainly, the overall benefit appears to be the sheer amount of sound it could pump out through its drivers and dual-opposing passive bass radiators, rather than exceptionally rich audio quality. Of course, the unit is no doubt an improvement over the little one, busting out much more volume and a fuller overall sound, but if we're being honest with ourselves, we can't say we found the quality any better than competitors like the Bose Mobile Soundlink. No matter what types of music files we used, there was always a sort-of mild low-fi veil over the sound. It becomes especially discernible once you step away from intimate placements such as having it on a desk. All in all, the lack of dedicated tweeters seems to be the main culprit for much of what we didn't like, but keeping its size in mind, we can't really knock it for not having any. So, onto that Live Audio business. This feature was present in the original Jambox, but we'll go over it briefly for those of you who are unfamiliar. Holding down the volume up and down buttons lets you toggle the mode to "enhance" your tracks -- and as you'd expect, the MyTalk voice informs you whether you've turned it on or off. Just as the moniker suggests, one of its purposes is to trick your ears into thinking you're hearing a band as you would at a live gig. In practice, it's merely okay for this scenario. While it certainly widens the soundstage and gives you the feeling that you're hearing a band over a PA system in the standing section of a concert, it also tends to bury vocals and unnaturally place subtle sounds in front of the mix (especially present with straight stereo rock 'n' roll tracks) -- whether this will be positive or negative for some folks, we'd be remiss not to mention that it can soften a song's bite. Unsurprisingly, the unit's demo mode produces sounds swaying from side to side, but all of our efforts to achieve a similar effect never came through with music, even when using spacious songs like "Bohemian Rhapsody" or Jimmy Eat World's "Get It Faster." These gripes aside, customizable sound options would be much appreciated in the future, especially EQ tweaks for those of us using services like Google Music on Android and Zune Pass on Windows Phone. You know, considering the speaker is updatable and all. There is much more to Live Audio that just music, though. Jawbone claims this is the first speaker to have "3D modeling." (How many times have we heard this before?) Essentially, while virtual surround sound aims to simulate speaker placements, Live Audio works to simulate sound coming from every angle. Using Dead Space and Need For Speed: Hot Pursuit, we were able to get a better sense of what the DSP could be capable of. Switching it on gave use a more immersive soundscape with a noticeably better sense of directionality in the vein of a virtual surround sound gaming headset. However, it still comes at the cost of the sound getting a bit mushy in some areas. Ending that point, it's worth noting that the quality of the effect is very dependent on the source material and does seem to work best with the likes of movies and games. Jawbone's rep let us know that over a time a variety of recordings will be made with Live Audio in mind to harness its abilities better. We do need to make one thing very clear: the Big Jambox, like the original, is excellent at pushing out gobs of volume and very good sound for its size. Our nitpicks with the sound quality are mainly to point out the limitations we found with this setup and our music library. The Big Jambox won't exactly come close to the capabilities of systems like the Klipsch G-17 Air for filling out large living rooms, but it is likely the closest you'll get from something portable. We found that the speaker worked best in this writer's 225-square-foot home office, meaning this could be a winner among college dormers. If you've got the means to carry it along with you as well, it's more than capable as a picnic system. The sheer versatility and ease of use you'll get out of this thing more than generously make up for any sonic shortcomings. Essentially, you can crown this the life of your moving party, whereas the Jambox is the ticket for more personal listening and people with space-limited bags. Of course, it wouldn't be a proper review of a Jawbone product without going into details about its noise-cancellation and in-call performance. The Big Jambox differs from the little one in this respect, as it's intended for more of a conference room setting (among other scenarios, of course). While the Jambox has a front-facing mic designed to be used in front of a user, this new guy sports a top-mounted omnidirectional one to pick up sound from all angles. Jawbone also notes that it's rated as class one speakerphone, which technically places it higher than that of its sibling. So how does it sound? As expected, the Big Jambox had noticeably better call quality on our end and on the receiving end than its little brother. While the Jambox tended to have mild cast of distortion and static, the big guy remained fairly clean and clear. Said assessment proved to ring true for the noise-cancelling microphones of both units, and we'd definitely chalk it up to the Big Jambox as the clear winner. But don't take our word for it, have a listen yourself using the sample above where we've simulated what it's like on a windy NYC day to compare the two. 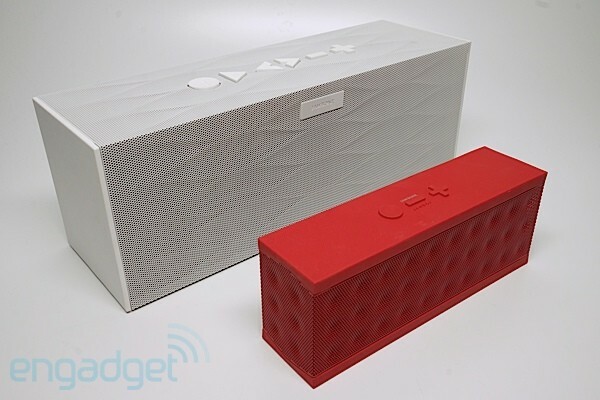 Jawbone Jambox vs. Soundmatters foxL v2... fight! So, is the Big Jambox worth $300 of your hard-earned cash? 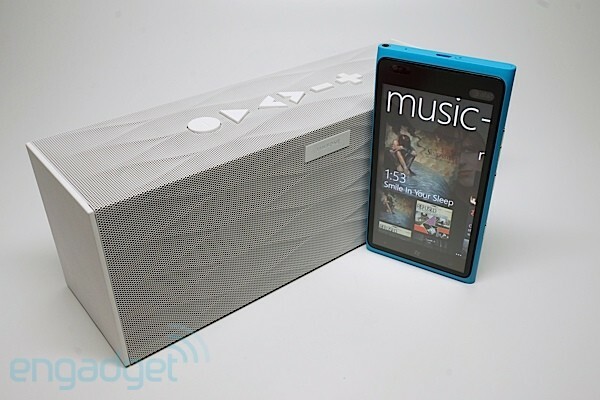 Furthermore, is that 100-dollar premium over the OG Jambox worth its weight? Aside from our concerns about the finer points of its audio fidelity, there's no mistaking how versatile this system is with the inclusion of MyTalk apps, extended Android functionality, healthy battery life and portability -- not to mention that it's an extremely capable speakerphone. As it stands, the unit would benefit from more expansive sound options, further app support for iOS and Windows Phone and the ability to share its juice with other devices. While the $300 price tag certainly puts it up against a bevy of other capable systems, Jawbone clearly has a standout in this supersaturated "speaker dock" crowd. Although the Big Jambox has struck a positive chord with us, there's no denying that it's lost some of the quirky cuteness that its itty bitty sibling won hearts over with -- this despite the $200 price tag, which is something to think about two years on. Basically, if you've been eyeing the Jambox but want something beefier, we'd recommend the Big Jambox without much hesitation for this type of kit. Overall, we'd say it's the better value of the two.